We’ve just released the final and official 2008 Minnesota Rural Real Estate data, containing every farm and timber land sale in every county. We now have over 48,000 sales in the database, stretching back to 1990. You can also use the site to link to my annual sales report, if you don’t feel like building your own reports. Any evidence of a Bust in rural real estate prices? Tune in and find out. 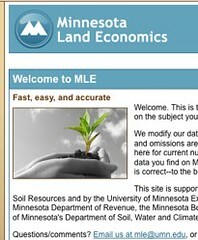 We loaded up the 2008 property tax data by jurisdiction and tax class on Minnesota Land Economics: http://landeconomics.umn.edu. You can find market values, tax levies by each taxing jurisdiction, credits, and net effective tax rates–all at any level of aggregation you choose. And while you’re there, be sure to check out the MLE MAP function, which now includes the new land productivity index and CRP contract data in addition to all the old favorites. Please give a call if you have questions. Extension specialist Mel Baughman reviews how your property tax is determined and covers everything you need to know about Minnesota’s two new tax relief programs: SFIA and 2c Managed Forest Lands. We’ve also got a link to a narrated slideshow on the same topic. Check it out. Since implementation of Minnesota’s new 2c Managed Forest Lands tax classification, many questions have arisen about exactly what acres are eligible. I’m forwarding information from the Minnesota DNR and Department of Revenue that goes a long way toward clarifying these questions. Thanks to Andrew Arends (MDNR-Division of Forestry) and Drew Imes (MDOR) for sharing this. As promised, the Department of Revenue was able to draft a great document to help resource managers determine which forest stewardship acres would quality for the 2c Managed Forest Land property tax program. Please see the attached memo and determination document from the Department of Revenue. Long story short – more acres will qualify with the new interpretations by the Department of Revenue. Eligible acres will be based on contiguous parcels that contain at least 20 stewardship acres. Basically, if the acres meet the definition of being a stewardship acre, it can be counted as 2c acres (provided there are at least 20 eligible acres in the parcel or in adjoining parcels). Sounds wordy so I suggest you look at the provided maps as visual examples of what might qualify for 2c. As before, please contact your local county assessor first if you have questions about a landowners application. A PDF version of the MDOR memo, including visual and text examples, is available from http://www.myminnesotawoods.umn.edu/docs/2cMFL-memo-MDOR.pdf. Where to find more information: Part of a detailed overview of Minnesota woodland property tax relief options, focusing on two recent programs: the Sustainable Forests Incentive Act (SFIA) and the 2c Managed Forest Lands tax classification. Comparing SFIA and 2c Managed Forest Lands: Calculations from a hypothetical property: Part of a detailed overview of Minnesota woodland property tax relief options, focusing on two recent programs: the Sustainable Forests Incentive Act (SFIA) and the 2c Managed Forest Lands tax classification. About the 2c Managed Forest Land tax classification: Part of a detailed overview of Minnesota woodland property tax relief options, focusing on two recent programs: the Sustainable Forests Incentive Act (SFIA) and the 2c Managed Forest Land tax classification.